The Vincentian Family in our Region of Panama is asking questions… very significant questions! Why do some projects fail to transform the lives of the poor? What causes the success of some other projects? The Vincentian Family in Panama, aware of the need to serve in the best way possible our masters and lords, the poor, has asked the International Team for the Promotion of Systemic Change a day of training and sharing experiences, to take firm steps towards that answer. On behalf of the International Team, we were accompanied by James Claffey, Juan Pablo Jácome, and Argelys Vega by the Latin American Commission. “The different forms of poverty increase day by day in the current situation in our country.” This challenges us and makes us strongly feel the need to collaborate in an effective and affective way, looking that our projects in favor of the most need be an alternative to change these diverse situations of poverty.” Faced with this situation, the following questions arise: “Why do some projects fail to transform the lives of the poor? What causes the success of some other projects? What strategies have been implemented in those projects that have been successful?” (National Council Vincentian Family Panama). We entrust these days to God and his Divine Providence so that within this family environment we can make the most of them. Day 1: we began this journey by placing ourselves in the hands of the Creator with the Eucharist. The morning served as the stage for us to enter this wonderful world of Systemic Change by the hand, first of all, of a real history of Systemic Change: “AGUA,” a project of San José de Ocoa (Dominican Republic), illuminating with this example that, when we attack the real problem, we can change an entire community. The morning progressed and also the development of the presentations, with a “Basic Notion” of Systemic Change, and I put it in quotes because it was a very complete and understood by the audience, which was demonstrated at the time of sharing in groups the presentations of the morning, which was concluded creatively with the presentation of the work once returned from lunch. During the afternoon we reflected on the concept of Vincentian Spirituality in Systemic Change and what are the essential elements for work in our communities. The audience has been very receptive and participatory throughout the afternoon. We thank the Creator for the shared experiences and we hope they will be very useful for the entire Vincentian Family of Panama but, above all, for them to revert in favor of God’s favorites, the poor. Information from Argelys Vegan via FamVin. St. Vincent de Paul encouraged five particular traits in his comrades: simplicity, meekness, mortification, humility and zeal. Come discover the stories of these virtues and how they are alive in the daily experiences of those around us. Who Can Help Us Change Perspectives on Poverty? Who Can Help Us Change Perspectives on Poverty? It is hard for a day to go by without encountering distressing stereotypes of those who suffer poverty. What can be done to counter these images? One of the initiatives of the celebration of the 400th anniversary of our charism seeks to identify and encourage creative ways of presenting the real face and faces of poverty in media. The Vincentian Family is sponsoring a Film festival and contest “Finding Vince 400,” focusing on exactly this issue. The judges will select films that inspire direct service to the poor and change our vision of poverty. These films will be premiered at Castel Gandolfo, Italy during the Festival later this year. We want to be sure that all in the Vincentian Family are aware of it and fully invited to participate. You yourself might not qualify. But as a group, we do know some very creative people. Help the Vincentian Family Office spread the word to those blessed by God with such creativity. Half of the world’s inhabitants live on $ 2.50 a day, that is poverty. More than a billion others live on $ 1.25 a day, that is extreme poverty. We can do something: storytellers, filmmakers, we need your help. Help change our perspective on poverty. Please share the attached brochure with the members of your groups and all the collaborators with whom you live your apostolate: parishes, schools, institutes, universities, youth groups; and any other person or group that may be interested in participating. This will be a wonderful opportunity for us – and especially for our youth – to carry forward the globalization of Charity. For more details about how to attend FV400 at: https://facebook.com/FindingVince #findingvince, #fv400. Find out how to submit at fv400.org. His approach is simple and direct; the presentation is rather brief. Set aside some time this week to ask yourself the following questions, based on the five Vincentian Virtues of Humility, Simplicity, Meekness, Mortification, and Zeal. Students from Niagara University and St. John’s University traveled to the Capitol in Albany on Tuesday, Feb. 13, to participate in the New York Student Aid Alliance Advocacy Day, an annual initiative coordinated by the Commission on Independent Colleges and Universities. The students spoke with New York lawmakers about the importance of universal access to state-sponsored financial aid. The two Vincentian universities met following lunch for a group photo and to discuss their visits with elected officials. Fr. Michael Carroll, C.M., was readmitted to Chestnut Hill Hospital over the weekend. Please keep him in your prayers. The student-mobility rating, published by The Chronicle of Higher Education, measures how effectively every public and private institution of higher education in the United States enrolls students from low-income backgrounds and graduates them into well-paying jobs. 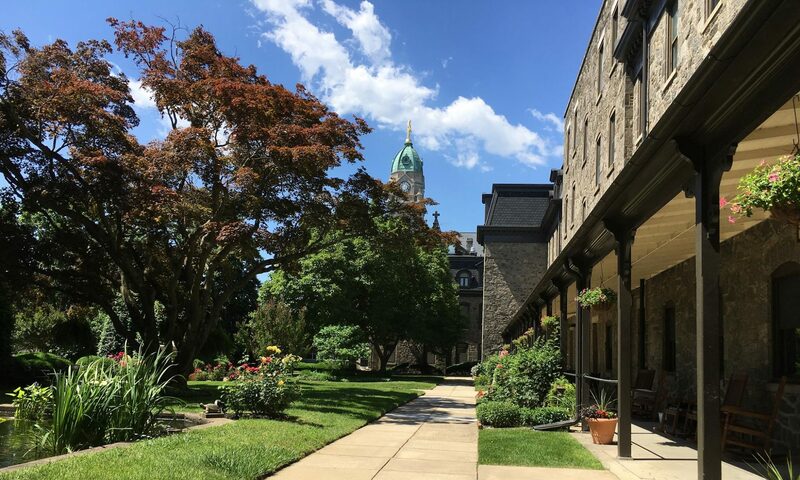 In the ranking that measures how recent graduates’ income brackets surpass those of their parents, St. John’s stands out among Catholic and private colleges and universities. In a recent national ranking that encapsulates the founding and enduring mission of St. John’s, the University was recognized as the number one four-year Catholic college or university in the country for its high student-mobility rate. The ranking, based on data collected by the Equality of Opportunity Project’s research, “Mobility Report Cards: The Role of Colleges in Intergenerational Mobility,” is a study that compared the median parent household income for students at colleges and universities nationwide. While many national rankings focus on the profile of incoming students by measuring student acceptance rates and standardized test scores, the mobility index measures student outcomes after graduation. The study examined data-driven variables for institutions such as tuition, the economic profile of the student body, graduation rates, early career salary data, and the percentage of students who significantly improve their economic standing after completing their education. Based on the research shared in the study, St. John’s University was ranked first among Catholic colleges and universities nationwide. Among all four-year, private, nonprofit institutions, the University placed second. When combining all public and private institutions, St. John’s was ranked 15th out of more than 3,000 four-year, postsecondary institutions. St. John’s has long been recognized as a university that provides students the opportunity to achieve a quality and affordable Catholic education. In recent years, the University has invested significant financial resources and made strategic investments in campus facilities, as well as the hiring of outstanding faculty and other personnel. The University community has worked to ensure student support, allocate institutional dollars to facility and technology improvements, expand career services, and create greater opportunity for local, national, and global partnerships. We spend our lifetime waking up! I kept thinking I knew what being a Vincentian meant but then I learned more. Each year I appreciate more the words of an 81-year-old Benedictine monk, Bede Griffith. “ I learned more in the last year and in my previous 80.” He kept waking up to more of reality. Vincent de Paul thought he knew what he wanted from life. Events of Chatillon and Follevile woke him up to the reality of spiritual abandonment and physical misery of those on the margins. But the insights of Chatillon and Folleville took him a lifetime to unpack. In his later years, he spoke often of his constant amazement as he unpacked the connection with subsequent events. Louise de Marillac had hoped to spend her life in a convent but was refused. Then she thought she might find what she was looking for in her marriage and her children. Finally, she woke up to the needs of the world around her and became the principle formator of the generous young peasant women who wanted to serve their less fortunate sisters and brothers. Frederic Ozanam began using his intellect as a staunch defender of the faith until he was challenged by an atheist. As a result of his exposure to those on the margins as he accompanied Sr. Rosalie on her rounds, he became the champion of the marginalized of his day. Elizabeth Ann Seton had it all – privilege, security and a loving marriage. She then lost it all but went on to discover the Eucharist. She found so much more and on the way to sanctity, laid the foundations for the Catholic school system and the Daughters of Charity in the United States. By paying attention they all woke up to so much more than the initially dreamed. Lent as a time for waking up. Too often we think of Lent as a time for giving things up. But it is so much more. Lent is a time for waking up. The root meaning of repent is to change your way of thinking. Put another way… Waking up to the meaning of Mathew 25 “whatever you do for the least of my brothers and sisters you do unto me”. I have been giving a lot of thought to waking up as a Vincentian and the meaning of “He has sent me to bring good news to the poor.” I am beginning to realize that St. Vincent left us his own “spiritual exercises”… the five Vincentian virtues. So this Lent I am focusing on waking up with the exercise of Vincent’s way of bringing “good news”. The Eastern Province is offering a series of one-minute videos each day of Lent. In these videos, a wide cross-section of people share their experiences of waking up. Sharing the one-minute video of waking up experiences of others. Asking myself what did I learn today. Sr. Regina Bechtle, SC, in a seminal article over a decade ago, captures the visions of our founders. Jesus’ vision: Good news to those on the margins – sick, prisoners, poor, immigrants, forgotten, powerless – THEY BELONG. Vincent & Louise’s vision: Christ meets us in the poor who have a claim on us. WE NEED ONE ANOTHER-WE BELONG to one another. Ozanam’s vision: Our world isn’t meant to be cold and heartless, but a place where all BELONG. Elizabeth Seton’s vision: We must live, pray, work together in deep, caring relationships lived in lives of service. Our call is to develop our capacity for hospitality, for communion. And isn’t this countercultural? Doesn’t this put us at one extreme of our U.S. society? Yet our call always nudges us to do precisely that. Enlarge the circle, make room for more at the table, think outside the box, dream bigger, color outside the lines, scan the horizon and look always beyond ourselves. Ask questions like: Who else needs to be part of this conversation, this planning? Whose wisdom are we missing? What if we invited XXXXXX to join us? And the reason for doing this – for heeding the call to conversion that translates into being servants of hospitality and communion and belonging? It’s not just because it’s a nice thing to do – it’s part and parcel of the Gospel challenge. It’s the way we must act if God’s dream is ever to be realized – the reign of God, the Kingdom that Jesus never tired talking about, and showing us what it might look like. How do we as individuals and organizations wake up to this vision of belonging… especially in an age stressing “me first” and isolation? More and more people are being excluded. One of the keys ways to waking up to belong in the real world is living with the tensions of holding on to the values of both poles. All of our ancestors to whom we look for guidance on this Vincentian way found energy there, in the AND. At times when we touch our truest self we know that too. Real life happens in the in-between, in the connections, in the struggle to live connected, to live an integrated, whole, holy life, not simply on either end. We get off balance, sidetracked when we resist the work of integration and opt for one side or the other. It’s a place outside of the COMFORT ZONE for most of us, isn’t it, a place where we often meet our own resistance. Let us use this Lent to enter into the middles of our world and the in-between’s of life. Let’s be the bridge to belonging! Read her full reflection… especially the section on how our resistances can be our teacher. Have I ever thought that belief in belonging brings tension? St. Vincent de Paul encouraged five particular traits in his comrades: simplicity, meekness, mortification, humility and zeal. Come discover the stories of these virtues and how they are alive in the daily experiences of those around us. Throughout the 40 days of Lent, a new story will be posted daily. See how the everyday practices of being honest, approachable, self-disciplined, realistic and hardworking, in the spirit of St. Vincent, can transform your own life and the lives of others.